This is the Rhesus Monkey and Capybara in Kyoto City Zoo. Monkeys look chilly.Everyone rounded the back, some monkeys to sneeze. "SARUDANGO" is the winter of institution. "Something come together in a group" = "become a dango"
The animals become dumpling when it comes to winter. This winter, I want to see a lot of cute DANGO! 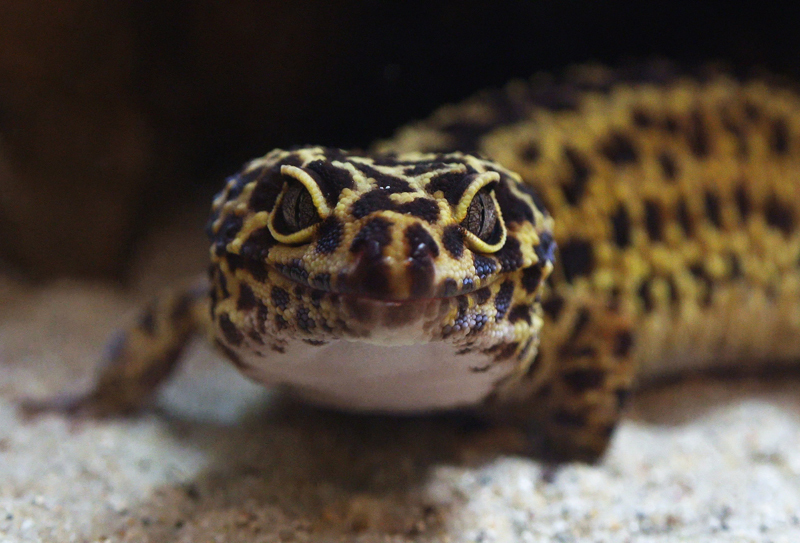 This is the Leopard gecko in Kyoto City Zoo. Leopard gecko is a reptile that is easy breeding. It seems to be popular as pets. In palm size, move slowly, very cute big round eyes! Town is covered with snow, landscape of shrines and temples would be beautiful as ink painting. However, I could not leave from the front of the stove.It's too cold. 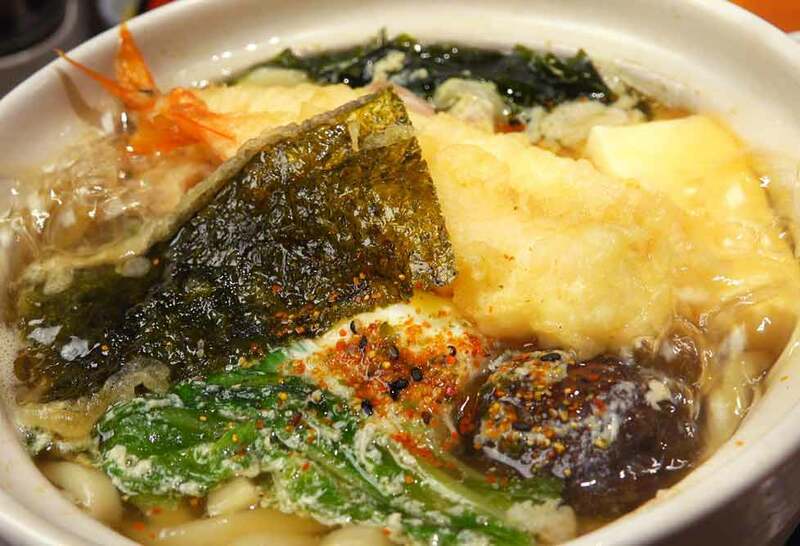 It can't be helped, so I made the Nabeyaki-udon videos for warm. This is a grooming video of birds in Kyoto City Zoo. Kind of birds is Flamingo,duck,Red-cheeked Ibis. Pale shadow that is reflected in the front is a cage. Comparing the grooming of three species of birds, the method of grooming looks birds common. The fluffy feathers looking so comfortably I want to touch. And I look at the the birds is a refreshing face, I also becoming want to grooming. It is a Red Panda (Ailurus fulgens) in Kyoto City Zoo. At the time of the meal, bamboo is placed on top of the big tree near the house. 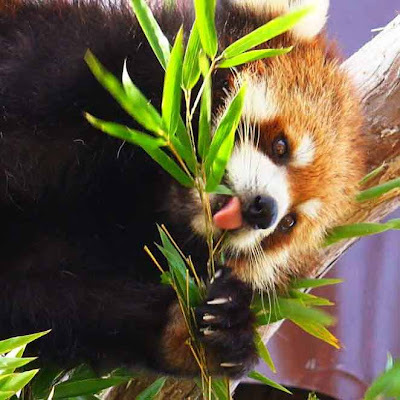 As you begin to eat to climb a tree, red pandas eat seriously and without shaking also Wakime. Gesture is cute, but the eye is a little sharp than when they are relaxing on the ground. I like such also cute as stuffed, but I want a little also see more wild. I took a picture of the Mikane-jinja Shrine in Kyoto. 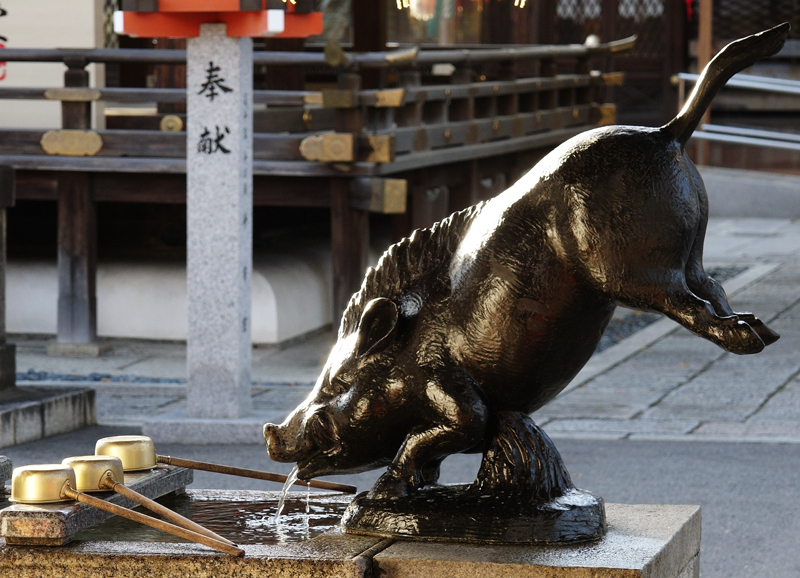 As the name suggests, Mikane-jinja is shrine worshiping money and metal in general. This temple have been very faith in the local. 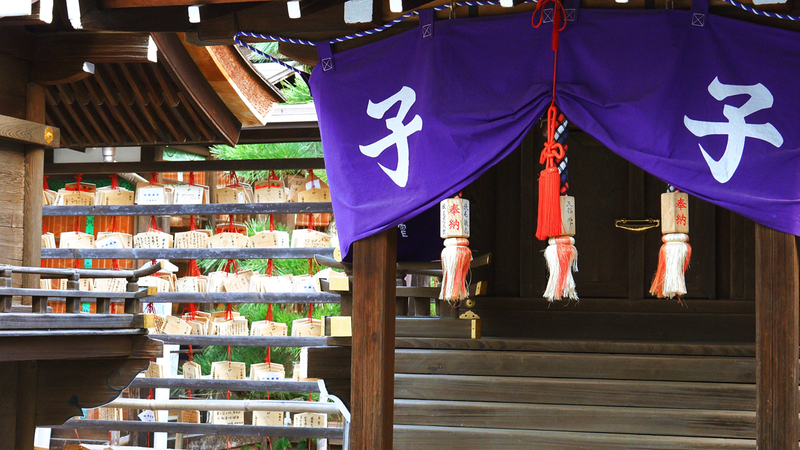 Because it is a shrine dedicated to money, many worshipers seems to wish surrounding money, such as business prosperity or success of Securities and Exchange or lottery prize prayer. Worship is possible 24 hours. Mikane-jinja Shrine in Midnight looks like the entire precinct is shining in gold. As would standing still involuntarily, this shrine have a unique atmosphere. This is a picture of Autumn leaves that were taken when I went to the shrine around Kyoto Nishijin. "Broad place" or "small and alley", everywhere I was able to meet the beautiful Autumn leaves. I am looking forward to next year's autumn. This is the autumn leaves near Kyoto International Conference Hall. This place is situated on the road around the Grand Prince Hotel by leaving the tunnel of Takaragaike-dori Street. Ranges is not widely, but it is beautiful about a looking forward to pass through here in autumn for the autumn leaves. I was shooting the Tadasu-no-Mori forest of Shimogamo-jinja Shrine in Kyoto. Tadasu-no-Mori forest is grove of the village shrine surrounding the Shimogamo-jinja Shrine. There has been widespread virgin forest with about three times the area of Tokyo Dome. Tadasu-no-Mori forest is not only as a stage of traditional events such as Aoi, also famous as the location thought to be flowing with mystical energy. I went to shoot it was the day after the rain of the time the autumn leaves of prime has passed. Although autumn leaves had finished, light leaking from between the trees that have been illuminated to sunset is so beautiful, I was able to enjoy the wonderful scenery. I was shooting the Shimogamo-jinja Shrine in Kyoto. This shrine has been registered as a World Cultural Heritage. Here is one of the shrines and temples with the oldest history in Kyoto, Tadasu-no-Mori forest in the precinct is also famous. Not only a power spot, lined with a lot of Shrine buildings and national treasure and important cultural properties, it is plenty attractions. Near the tower gate, there are famous as the god of marriage "Aioi-sha" and Kimigayo lyrics in familiar of "pebble". There are really a lot of Shrine buildings and beautiful scenery to Shimogamo, it will vary depending on the season. So we even went many times there is a new discovery. I'd like to cold season landscape also shooting of winter to visit now. Tadasu-no-Mori forest Video Tadasu-no-Mori forest is grove of the village shrine surrounding the Shimogamo-jinja Shrine. I took a picture of the Kamigamo-jinja Shrine in Kyoto. This shrine has been known for Aoi-matsuri. The approach and the precincts are planted cherry. Cherry blossoms that bloom in the spring is very beautiful. You can see the mountains of conical sand When you enter the precincts. This is called Tatezuna. Tatezuna represents which is the object of worship "Mt. Ko-yama". When you enter the back of the shrine there is a vermilion Tower Gate. When Passing through the gate there is a national treasure of the main hall, but it is currently under restoration. 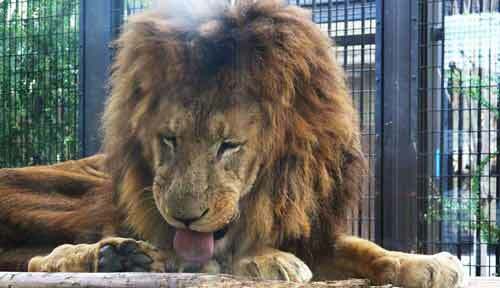 It is a Spheniscus humboldti in Kyoto City Zoo. I had thought,Penguin of the epidermis is smooth as dolphin. However, I know that has grown feathers by shooting in zoom. After all penguins are birds. This is the Autumn leaves around Tenryū-ji in Arashiyama. I was through the Tenryū-ji on the day that I went to take a video of the ship. This is a picture that was taken at that time. The leaves are dyed in beautiful red, it shines in the sky and light, vivid landscape had spread. 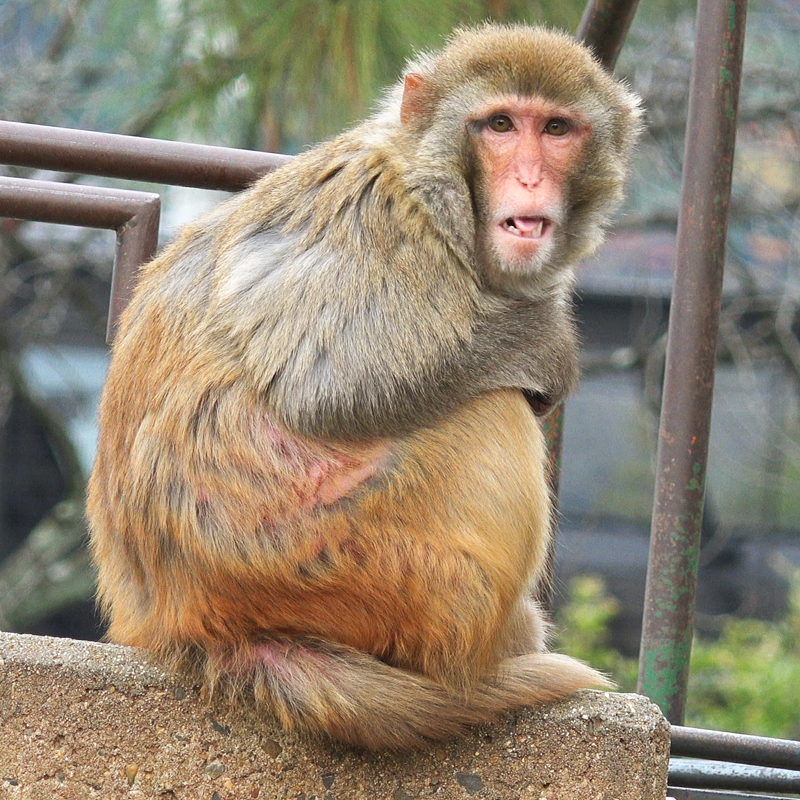 It is a rhesus monkeys in Kyoto City Zoo. Most of the monkeys have at home relaxing. Latter half, one monkey is in a hurry to become in charge to play equipment that are relaxing the other monkeys in the state such as It is a good horse that never stumbles. Area of monkey when taken was a time that monkeys are leisurely, any monkey did not even get tired like looking at the middle-aged ma of the neighborhood. I took a picture of the Kuginukijizou Temple in Nishijin Kyoto. This temple was founded by Koubou Daishi. The official name of this temple is syakuzou-ji Temple , but It has been known for popular name of Kuginukijizou in Kyoto. There are images of the large nail pull in front of the main hall,Around the main hall is lined with a lot of the statue of Buddha and the stone statue and thevotive picture of nail pull. This temple have been very faith in the local, a lot of people have always worship. I took a picture of the Seimei-jinja Shrine in Kyoto. Here has been enshrined Onmyoji-ABE no Seimei. After the death of Seimei, this shrine was made in his mansion trace of foot of the Ichijo Modori-bashi Bridge. Five-pointed star (Seimei crest) is listed in place throughout the building, it is very impressive. Shrine foundation at that time had a vast site. However, the scale is reduced gradually due to urban development by Hideyoshi Toyotomi and war, shrine was followed by a period of remains devastated. In recent years, Onmyoji-ABE no Seimei became famous by such as games and comics and novels and movies. As Seimei is become famous, precincts is at once developed, now a lot of people visit the shrine. This is the Bar-headed goose of Kyoto City Zoo. Faintly captured area shadow on the screen is cage, behind the Bar-headed goose There are ducks and black-headed gulls. Pose to stretch by raising the foot is like a ballerina. 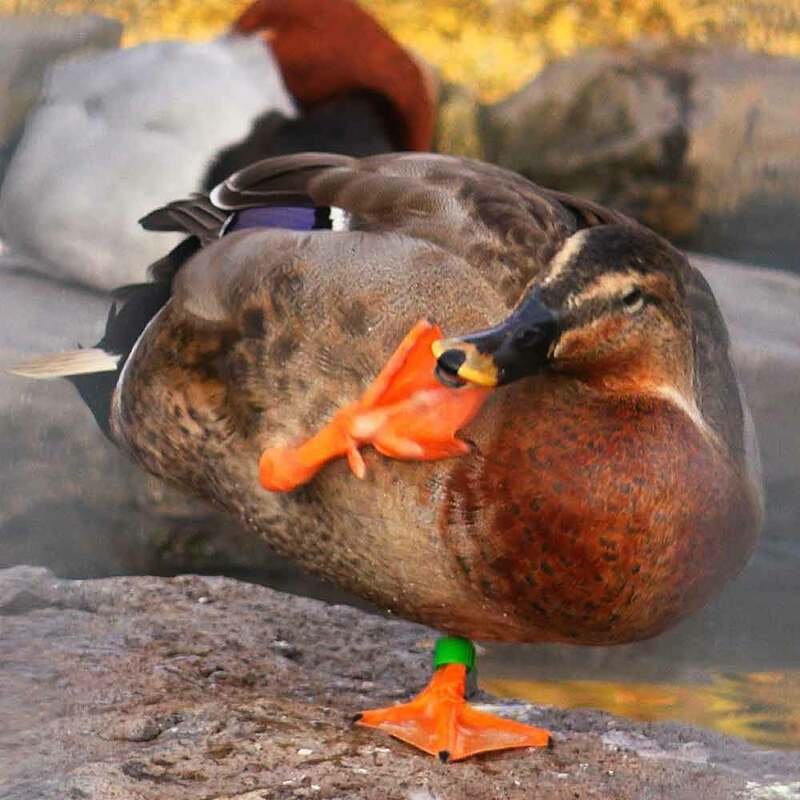 After the pause, the bird will stow the foot in the feathers. This seems to action for the maintenance of body temperature. It is a Tiger and Guinea pigs and Fennec of Kyoto City Zoo. Tiger and guinea pigs are quite relaxing, it is very cute in like a stuffed animal. Fennec is a little wary feeling because he Nearby parrot is crazy squeal in a loud voice. I took a picture of the Kifune-jinja Shrine in Kyoto . Around the shrine is surrounded by trees dim daytime, there has been floating around the mysterious atmosphere. The day I was taken, in the day of rain, which was only just the prime of autumn leaves, scenery is a little lonely shades of before winter preparation, Kibune is where the color of the red torii and landscape change with the seasons colors are beautiful. This is a sparrow that gather to feeding grounds in the duck corner, Kyoto City Zoo. Sparrow will have gathered by slipping between the fence. They single - mindedly eat food, but sparrow that had gathered at the timing of something flies away all at once. Then, there are always escape delayed sparrow. Beak little by little movement at high speed, is cute how are quite impatient. However, it is dangerous when this in the forthcoming really crisis. I want to run away with a strong will not be fooled by the food. I took a picture of the Autumn leaves in Kinkaku-ji Temple Kyoto. Speaking of Kinkakuji, golden reliquary hall is too famous. But is the Temple of the Golden Pavilion and famous too golden reliquary hall speaking, autumn leaves of garden was impressive enough not lost the gold. I took a picture of the Kinkaku-ji Temple in Kyoto. This time, I have put together around the photograph of the garden. In the garden at the back of Kinkaku have planted a lot of maple, we can see the Kinkaku shining through the trees that were colored. When you exit the back of the garden there is a Fudo-do. You worship and lit a fire to candle in accordance with your wish. I took a picture of the Kinkaku-ji Temple in Kyoto. I took many photos, but this time I have put together around the photograph of Kinkaku. Just garden of autumn leaves at the peak, the contrast of gold, red, green, and blue of the sky was very beautiful. Buddha and Yoshimitsu Ashikaga statue on the first floor of the Kinkaku, you can see the camera zoom or binoculars. This is the one end of the Doves society that I glimpse when I went to the shooting of the video that was posted the other day. 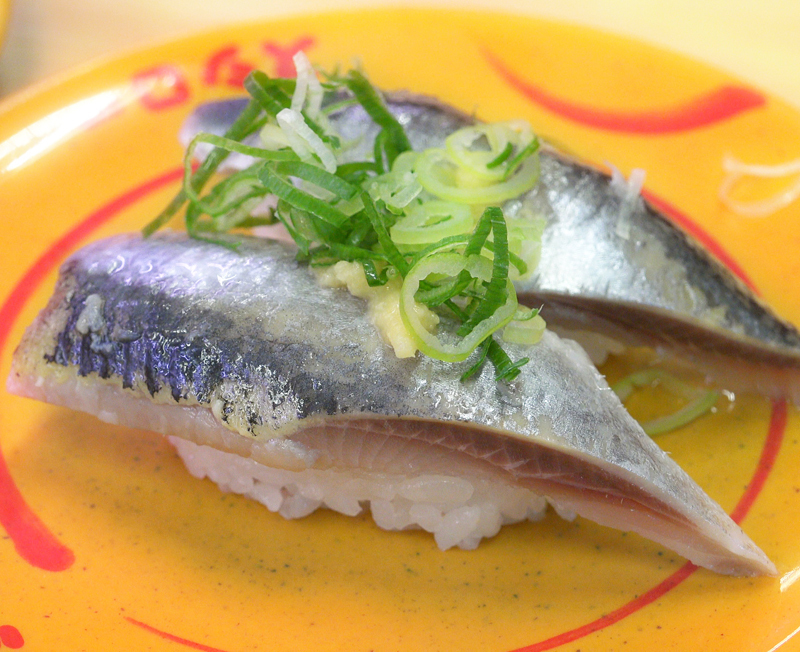 Dove tail has white hair also of foot white bushy will have a monopoly on rice ball with full force. The Doves is threatened other Doves come, it was driving away to be closer to the rice ball. Pigeons that are around are somehow try to eat a rice ball, but does not seem to be able to approach it is pushed by the spirit against the rice ball. I've been a while also observed after shooting, only this one bird was it that eat the rice balls in a lot of Doves. Doves society is also tough. I have shooting the boat in the vicinity of Togetsu-kyo Bridge Arashiyama Kyoto. In this area, a small ship such as Hozugawa River rafting boat or houseboat and rowing the boat has to go back and forth a lot. In the fall you will be able to enjoy the Autumn leaves of the mountain while crossing the river. There is also a video that shoot the Togetsu-kyo Bridge on the same day! This is the autumn scenery of Togetsu-kyo Bridge Arashiyama Kyoto. Against the backdrop of autumn leaves and trees, the small ship goes the river and comes. There are also videos that shoot the pleasure boat and Hozugawa River rafting boat around Togetsu-kyo Bridge on the same day! I was shooting up around the Deva gate of Kiyomizu Temple from Ninen-zaka Slope. Around the Kiyomizu Temple is visited by most tourists in Kyoto. Here is lined with shops to roadside, it is a place with views of the temples and towers in the distance. It is one place where you can enjoy the most Kyoto-like atmosphere in Kyoto. I was shooting the Goedo and Karamon of Nishi Honganji. The colorful and wonderful sculpture of Karamon you forget over time as the nickname of "Higurashi-mon". This is a landscape of autumn leaves in Kyoto Arashiyama Takao Parkway. I tried to take it by placing the camera in the car, but I have little sway. We can be colored trees look from the window, from the resting place in some places, such as the Kyoto city and the boats of Hozu-gawa River rafting, you can enjoy the spectacular views. Trees that are dyed in bright red in the background the green of the sky of blue and mountain has been tossed to the wind. It was impressive very beautiful, I was shooting the video. This is the autumn leaves in Kyoto Arashiyama Takao Parkway. Maple of this day has not yet become completely red, green, yellow, red and three colors of the leaves was very beautiful. Vantage rest station is provided in the middle of the road, we were able to enjoy the autumn leaves. If there is a chance that the time of the autumn leaves come to Kyoto in the car, please try by all means drive once. Heian Shrine in the east of Kyoto is a relatively new shrine which was built in 1895. Beautiful shrine and wide precincts in glowing red like vermilion pillars and white walls with a green roof, will overwhelm what you see. Here is the Togetsu-kyo Bridge Arashiyama Kyoto. This day, the wind is strong in the next day of the typhoon, the camera has been shaking a little. 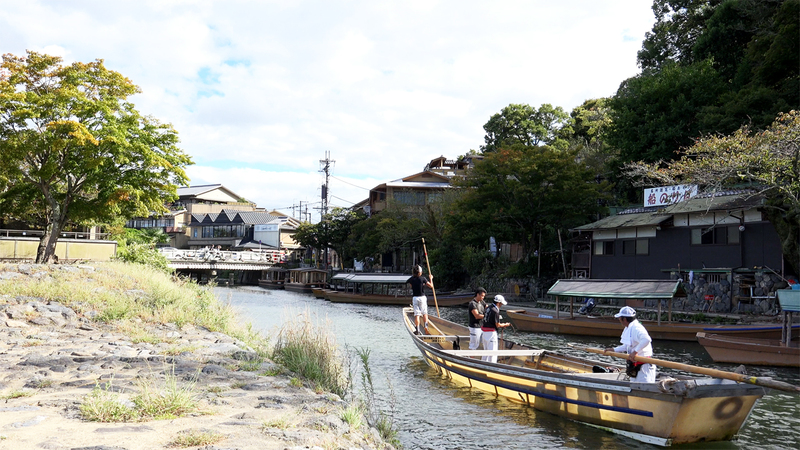 Rickshaw , ship floating in the river― Near the Togetsu-kyo Bridge is the place where you spend the Very relaxed time. I've shot this video in green season.In the other, you can enjoy a variety of landscape, such as autumn leaves, winter snow, the cherry blossoms in spring. Arashiyama is where you can enjoy seasons beautiful landscape four seasons. This is the morning of Takaragaike park.Birds is crazy about breakfast and grooming.There is a part the subject is out of focus, but I was adopted because too cute.The Kyoto International Conference Hall look in the back of Takaragaike panoramic view.Takaragaike is located in the immediate vicinity of the International Conference Hall Station of the Karasuma Line of Kyoto City Subway.Pond is round about 1500 m.I will be very healing and have gathered wild birds and carp in there. This is a movie that I was the first shot. When I have shotten a cute puffball, train went just through. The place is a small park near Eizan train Iwakura Station. This camcorder is easy to use and is light, easy to shoot 4K high-quality video and still images even for beginners! This software can handle the 4K video. (Writing also possible) Editing is easy and intuitive operation.